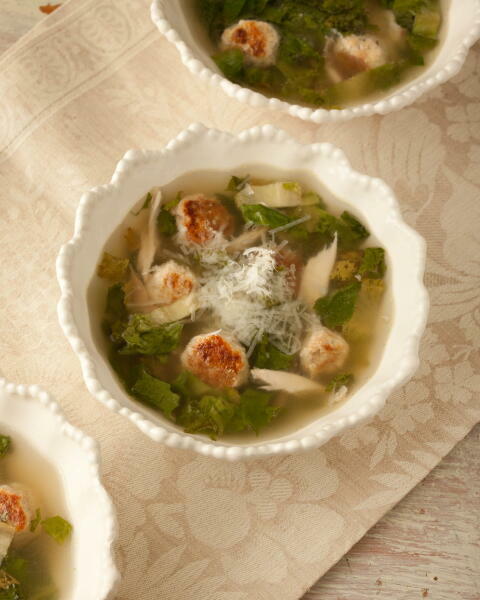 One of the most beloved soups of southern Italy and served at many a wedding where it is known as wedding soup (minestra maritata), escarole and meatball soup is welcome anytime but especially now when sturdy heads of escarole are available. Escarole is an essential ingredient for this soup but besides that, it is also loaded with vitamins. Some cooks like to add tiny soup pasta like acini di pepe or orzo to the simmering soup. Stud the onion with the cloves and place in a large soup pot with the celery, carrots, bay leaf, parsley thyme, chicken wings and lemon slices. Cover the ingredients with water and bring to a boil. Turn the heat down to simmer so that the water is barely moving. Cover the pot and cook for 1 1/2 hours. In a small bowl combine the breadcrumbs with the milk and set aside. In a medium bowl add the veal or chuck, egg, cheese, garlic, salt and pepper and the soaked breadcrumbs. Make meatballs the size of marbles. Grease a rimmed baking sheet with the olive oil and place the meatballs o the sheet as you make them. Bake in a preheated 350F oven for 20 minutes or until lightly browned. Transfer the meatballs to a bowl and refrigerate them. These can be made three days ahead. Remove the chicken wings from the pot and set aside on a cutting board. Strain the broth through a sieve, pressing on the vegetables to extract as much liquid as possible. Discard the solids and return the broth to the pot. Bring to a boil and stir in the escarole. Cook 3 to 4 minutes just until the escarole wilts. Add the meatballs to the broth. Remove the meat from the chicken wings and add it to the broth. Correct the seasoning and add grated Pecorino cheese on top. Serve hot. As it happens, I found another version of an Italian wedding soup. But it uses Parmesan instead of Pecorino cheese. And aside from escarole (endive) it also has kale. Like other Italian dishes, do wedding soups vary from region to region, or city to city? You are so right; the ingredients vary from cook to cook; that is the beauty of Italian cooking! Do you have to use chicken wings or shredded breasts? Oh, that's great insight into Italian cuisine. Thanks, Mary Ann! By the way, here's that wedding soup recipe I was talking about. Do you know which city or region this might have come from?